So, I grew up eating spaghetti quite regularly. Spaghetti was in my mom’s weekly rotation and I actually loved it. I still love spaghetti to this day. When I married my handsome man, I quickly found out that he is not really a fan of spaghetti. Huh? Who doesn’t like spaghetti? I quickly found ways to win over his heart with pasta and marinara and learned that meatballs and penne pasta are the ticket to his spaghetti-loving-heart. Well, good news is that I recently found this Spaghetti Pie to fit the bill too! I, of course, loved it and was slightly hesitant to ask for Beau’s honest opinion after dinner. I took the plunge and asked him what he thought and was delighted to hear that he really liked it! You don’t know how badly I want to start putting this spaghetti pie into my weekly rotation, but I’ll try not to totally push my luck (so, maybe every-other-week will work. . . haha!). 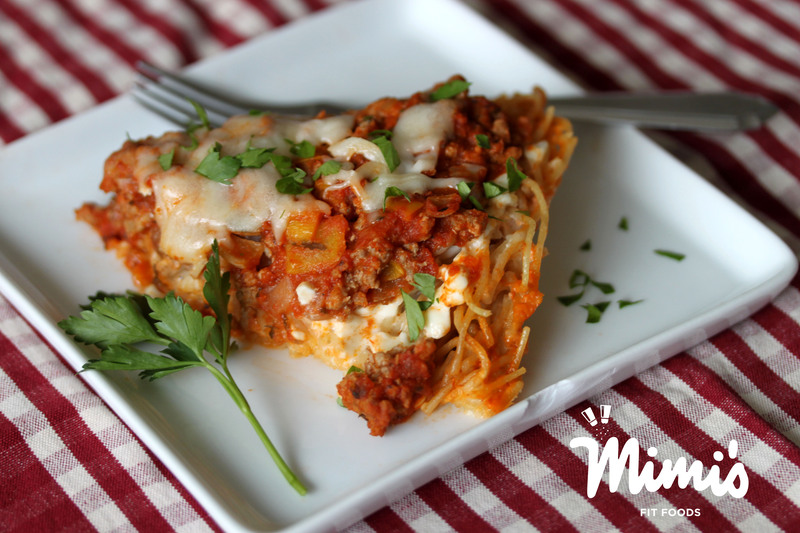 This dish led to a nice traditional mixture of flavors between spaghetti and lasagna. The cottage cheese helps to enrich the flavors and the noodle crust (which is filled with pasta, eggs, and cheese) was fabulous when paired with the cottage cheese and marinara meat mixture. I’m not gonna lie . . . I was kind of sad when Beau took the leftovers to work because I REALLY wanted them. But, on the other side of things, I was pleased that he wanted to eat them too. I guess that means I can make this again sooner than later. Whooohooo! Cook spaghetti according to package directions. Drain well and cool to room temperature. In a bowl, combine the spaghetti, 1/4 cup mozzarella cheese, egg, and egg whites. Transfer to a 9-inch pie plate coated with nonstick cooking spray and form into a crust; set aside. In a nonstick skillet over medium heat, cook turkey, onion and bell pepper until turkey is no longer pink; drain. Add spaghetti sauce; heat through. Spread cottage cheese over crust; top with turkey mixture. Bake uncovered, at 350 degrees for 20 minutes. Sprinkle with mozzarella cheese. Bake 5 minutes longer or until cheese is melted. Let stand for 5 minutes before cutting; cut into 6 slices. I made this last night – it is fantastic! Michael doesn’t like spaghetti either – it was all I knew how to make when we first got married – he really liked this.